Kansai (Western Japan) style sakura mochi is sweet bean paste and a bumpy gelatinous outside made from Domyoji-ko. Domyoji-ko is steamed mochi rice which is then dried. I think it looks like coarse sugar when it is dried and I think it is then re-constituted when it is used to make sakura mochi. Kanto (Eastern Japan) style sakura mochi has a thin mochi outside, the sweet bean paste filling and the salted sakura leaf. 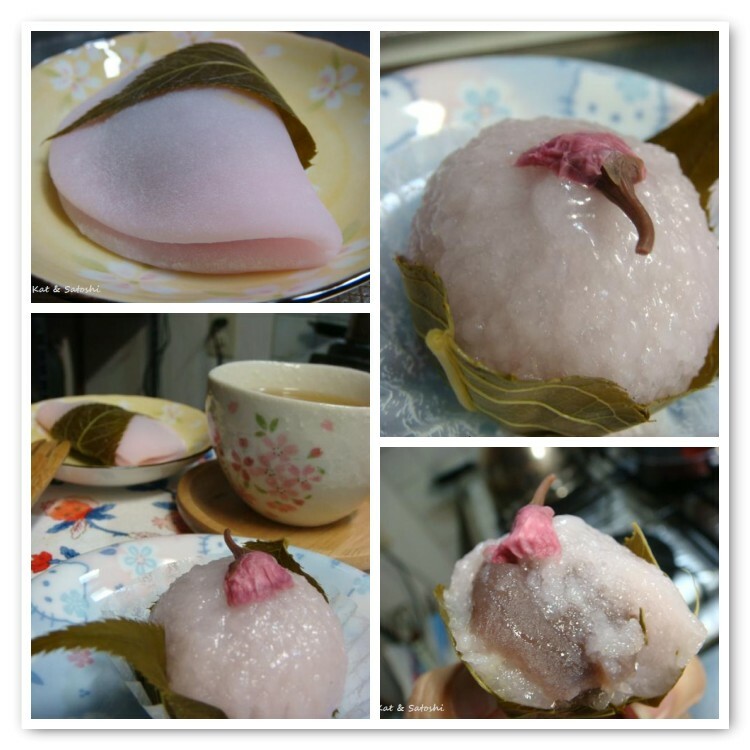 Sakura mochi has a salty and sweet flavor---salty from the sakura (cherry blossoms and leaves) which are soaked in a salt water mixture, sweet from the sweet bean paste. On one of my walks, a Mini that I saw pull into a bank parking lot. Sakura (cherry) tree in full bloom on one of my walks. Fresh tulips decorate the lobby area of the Hilton West Plaza. An animal hospital that I saw on my walk, has these cute dog parking stops, though I think they should change them, aren't they supposed to be taking care of the animals? not "using them" as parking stops?? Shrimp fried with won-ton wrappers at Ou-Lou (Hanshin Department Store). I've had this with spring roll wrappers before, this version is just as delicious. 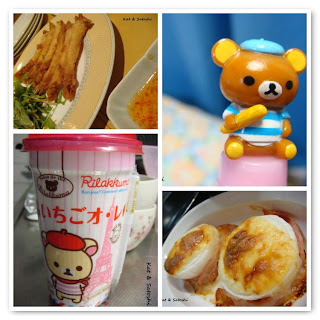 Rilakkuma, a character by San-X (which I think its name is a combination of "relax" and "kuma" , is currently in French mode...I found this mechanical pencil (which the Japanese call "sharp pencil") at Kiddyland and this strawberry au lait drink at Lawson. An easy side dish for dinner. The recipe was on one of my calendars. Cut an onion in half, wrap some bacon around the base, top with cheese and roast for about 30 to 40 minutes (220°C/420°F). Easy, cheesy and delicious! 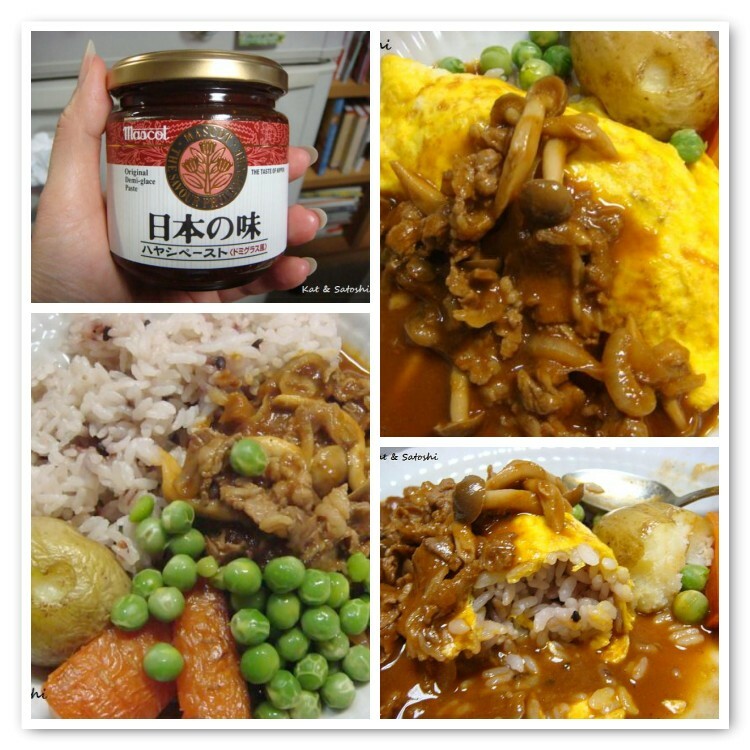 Mascot's hayashi rice (hashed beef) roux has a demi-glace sauce base. I browned some onions and fresh mushrooms, then added some thinly sliced beef. Diluted the roux with 2 cups of water and simmered. A delicious rich "stew". I also boiled some fresh peas and roasted carrots and potatoes. This was a different but delicious version of "hayashi rice". Since the sauce was demi-glace, I thought this might be nice over omurice (an omlette which envelops some rice) for another dinner....I was right. Byron Bay's Sticky Date and Ginger cookies, chewy with small kicks of ginger here and there, great with a cup of tea! The chicken nugget mustard sauce at McD's tastes like French's yellow mustard but creamier. Maybe leaning a bit towards honey mustard-ness? Anyway, this is my sauce of choice now. Oh, and why are the nuggets and side salad so expensive? Total 550 yen (about US$5.50) for the two items...if you choose a salad instead of fries with your burger set, you'll need to pay 30 yen (about US$.30) extra...kinda like penalization if you ask me. 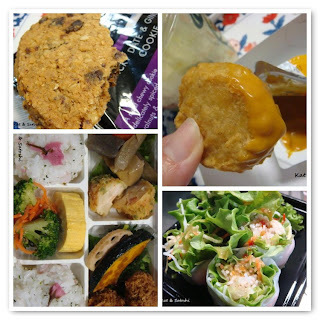 RF1's sakura bento...loved all the okazu (side dishes) and the rice was so cute with the sakura flower on it. Vietnamese summer roll by RF1, they serve this with nuoc mam (sweet chili sauce). On one of my walks I spotted a Lotus Europa Special revving its engine in front of an auto body shop (by the way, there is also a yellow Ferrari Testarossa in the garage). Kuri (chestnut) jam from my student (Thank you). This was chestnuts and sugar, more like chestnut paste though not as sweet...delicious! Hoegaarden's White Beer (5% alcohol) kinda fruity and fizzy, different. Gobo (burdock) salad with 7 different veggies in it...love the creamy sesame dressing and crunchiness from all the different vegetables. Savory taiyaki, this version is similar to okonomiyaki, the bottom is pancake-like, there is shredded cabbage and red pickled ginger, the top is an egg and there is okonomiyaki sauce in there...different but delicious. Have been interested in these music cases that are like backpacks. When I was in highschool we never had cases this colorful nor this easy to carry. Every couple of weeks we get our recyclables taken away. These guys on bicycles come ahead of the city trucks to take the aluminum cans. The guys on bikes are actually doing this illegally because our tax dollars are being used to pay the trucks. I remember once, one of these guys had a big bag of cans on the back of his bicycle and the bag broke...cans everywhere! Remember I thought that Tougarashiya had a kim chee sushi? Well, I mis-read their sign, it said "korean-style" sushi, not "kim chee" sushi. Whew...sorry this was a long post there was so much to share and not enough days to post. Yesterday, while I was out grocery shopping, we had tiny hail (size of coarse salt, Hawaiian salt??) and some rain! I couldn't believe it. It was only for a couple of minutes but it was hail! Then in the afternoon, the wind was so strong and blustery, I had to keep my eye on our Christmas tree on the lanai to make sure it wouldn't fall over. 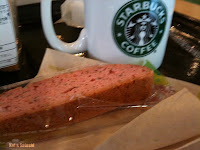 Another thing I couldn't believe is that I went to Starbucks 3 times in one week...here are some of the things I ate. 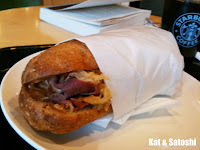 The Filone beef and sauerkraut sandwich at Starbucks is similar to the reuben. The bread is a chewy baguette, there is fried onions, and lots of sauerkraut in there...I like this. On this visit, I had my first iced coffee of the year. On another visit, I tried their sakura biscotti...um, no! the flavors are all wrong. I also struck out with their BLT on this visit. Since the cold came back, I went back to hot coffee on this visit. My last visit for that week was with Tamakikat. I tried their azuki matcha dacquoise...this was nice. Not too sweet, though the azuki wasn't present. Yesterday, the 3 year memorial service for FIL went smoothly, but I am pooped. Here is something I've had in my drafts. I tried Ellie Krieger's Energy Bar recipe from "The Foods You Crave". If you don't have the book, you can find the recipe here. I didn't have all of the ingredients, so I kind of ad-libbed here and there. Still, it was easy to put together, though after baking it, it still smelled and tasted a bit "eggy". I was looking at other energy bar recipes and I think the next time I try this, I will use egg whites instead of the whole egg. Unlike the US dogs who say, "ruff ruff, bow wow or woof woof", dogs in Japan say "wan"..."wan wan". By the way, cats are "neko" (neck-oh) but they are often called "nyan-ko chan" as "nya" or "nyan" is the sound they make..."nya nya". Anyway, this is Hana-chan, a yorkshire terrier of an acquaintance. Her owner says that Hana-chan doesn't always like everyone. Guess she was okay with me as she couldn't keep still and wanted to be close by. I've passed this house many times on my walks and the very first time I noticed this HUGE St. Bernard, I was bummed I didn't have my camera. The owners have an old bench car seat in their living room and he hangs out there. They even leave their living room door wide open (so I could take a photo of him). He makes the seat look pretty comfy, yeah?? What do dogs and cats say in your country? 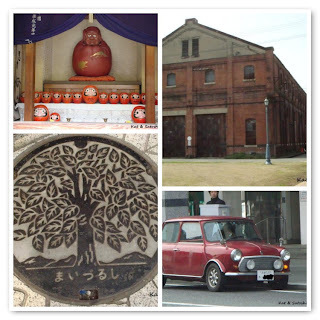 There weren't too many sights in Obama city, mostly temples and some historical areas. I think if we had rented a car, we could have seen more scenic spots. Anyway, I wanted to show you some chopsticks, I didn't realize that there were different types of chopsticks for different foods. My chopsticks when I ate soba were thin at the ends and slightly squared, this is to prevent the noodles from slipping out of your grasp. Satoshi's chopsticks when he ate his kaisen donburi were thicker and slightly rounded, perfect to "scoop" or "balance" rice and the toppings. 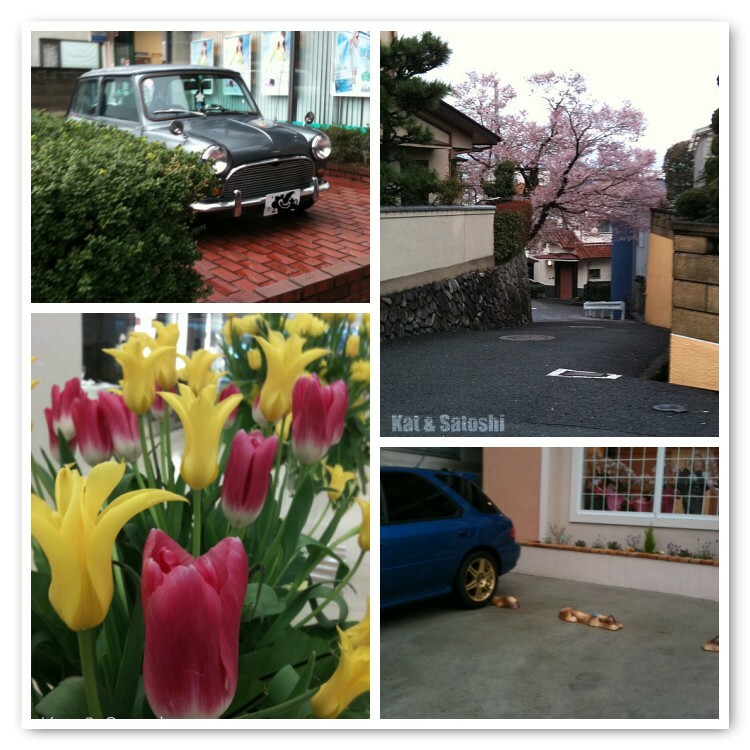 On the other hand, one thing that you will see especially in the Sancho-machi area of Obama, is that many homes and shops look like some that you see in Kyoto. Many homes and shops have been preserved to have that "traditional Japanese" look. We happened to walk past one of these preserved shops called Kokoro (heart) and couldn't resist the delicious aroma of their freshly baked bread. The inside of the bakery is decorated with all sorts of wooden Japanese candy molds and the bread is baked in an ishigama (stone oven). They had all sorts of breads as well as tarts. We each bought a snack for the train. I picked up the milk bread 100 yen (about US$1) and Satoshi chose the yomogi (mugwort) anpan (baked bun with sweet bean paste)...180 yen (about US$1.80). My milk bread was really soft and delicious, kind of like brioche. Satoshi enjoyed his anpan, the yomogi was really fragrant. We also went back to the Fisherman's Wharf to pick up a yakisabazushi (grilled mackerel sushi) to share for our lunch on the train....1050 yen (about US$10.50). The grilled mackerel sushi was delicious, very smokey. It is layered with pickled ginger and shiso (perilla leaf). They actually give you some shoyu, but it isn't necessary to use as there is lots of flavor. On the train, we also tried this musubi with Hokuriku minced pork flavored with miso (soy bean paste), shoyu & sugar, which we picked up at a convenience store....115 yen (about US$1.15)....delicious, sweet and salty. And some iwanori (a soft laver that is found on the rocks and is seasoned)...420 yen (about US$4.20). We tried both the ume and iwanori for breakfast on Tuesday, yum! 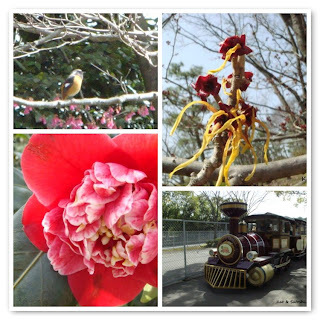 From Obama, we stopped at Higashi Maizuru (East Maizuru) which is in Kyoto Prefecture. About a 15 minute walk away from the station, there is an area of red brick warehouses which was used by the Japanese military during the Russo-Japan war (1905? ), which Satoshi wanted to check out. Most of the warehouses are still standing and are now used by the Japan Maritime Self-Defense Forces, the Japanese do not consider this their "military" but in my opinion, this is their version of the Coast Guard. Along the way, we saw a shrine with daruma, this is actually the area where shopkeepers in the shopping arcade come to ask for properity and good business. We also spotted a nice Red Mini. It was a quick trip, despite the bad weather on the first day, we had LOTS to eat and enjoyed seeing two Hokuriku cities. There is a story of Happyaku-bikuni (800 year old nun), which tells of the longevity of the people of Obama. In Obama, there once was a rich man named Takahashi Gondaiyu. One day, he was invited by a fisherman for dinner. He went over to the fisherman's house and happened to see the kitchen area. The food that they were preparing was something he had never seen before. One of the dishes that they brought out was a platter of sliced ningyo (mermaid). Skeptical of eating the ningyo, Gondaiyu ate the other foods and didn't touch it. 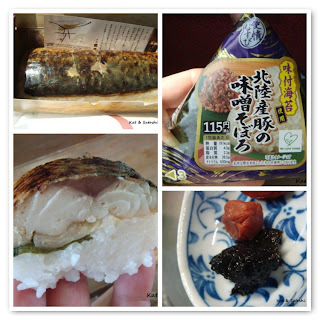 The fisherman insisting that this ningyo was gochisoo (special foods for a special occasion) wrapped up the ningyo and sent it home with Gondaiyu. Gondaiyu reluctantly brought it home and tucked it away in the kitchen where no one would see it. That night, his 16 year old daughter found the wrapped ningyo and tried a piece. It was so delicious that before she knew it, she had eaten all of the sliced ningyo. The next day, her father looked around for the ningyo but couldn't find it. His daughter confessed to eating it. Her father worried that something bad would happen to her because she ate it. As the years passed, everyone but his daughter aged. More years passed and everyone in her family passed away leaving her still looking young but very alone and sad. Everyone in the village gossiped that her youth was due to eating the ningyo. Since she was alone, she decided to become a nun and travel around Japan to bring happiness to others. 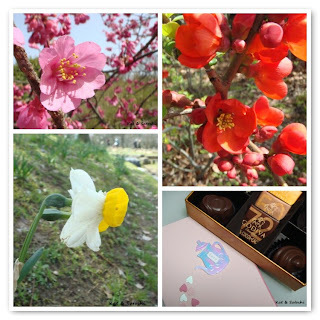 Everywhere she went, she planted a tsubaki (camellia) tree. Finally when she was 800 years old, she returned to Obama and entered a cave. Near the cave she planted a single tsubaki (camellia) tree and told the people of the village, "when this tree dies, you will know that I too have died". The tree still stands today next to the cave near an area next to the Yahata shrine. After coming out of the wind and the rain, we checked into our hotel, Hotel Urban Port Hana Tsubaki, located along Obama Bay. After checking in, we went to the separate bathing areas and took a nice soak, working up a nice appetite for a dinner of...kani (crab). 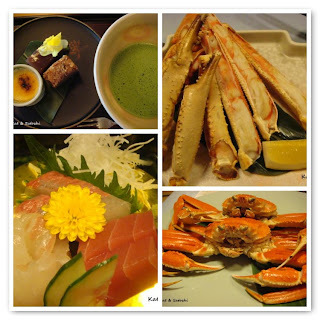 Besides the appetizers and sashimi (sliced raw fish), there was boiled crab, grilled crab. 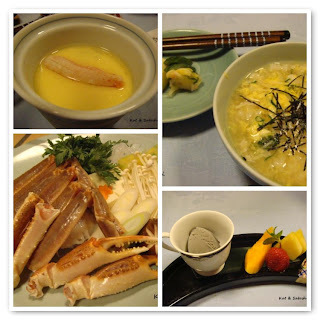 There was also a crab hot pot, chawan mushi (savoury custard filled with crab, unagi (eel), some shrimp, ginan (gingko) & yurine (lily bulb)), zosui (porridge using the stock from the hot pot, leftover crab, rice, egg and green onion), tsukemono (pickled veggies) and dessert (black sesame ice cream & fresh fruits (papaya, strawberry & pineapple). Boy! were we stuffed after dinner. We calculated that each person had about 2 crabs each. Satoshi was surprised that I ate most of my share, as most times I leave a large portion of my food for him to finish. My favorite crab preparation would have to be boiled, it was the easiest to eat. Grilled crab was the hardest to eat because it stuck to the shell. The next day, we awoke to a beautiful day. If you thought dinner had a lot of food, breakfast the next morning was almost just as large. 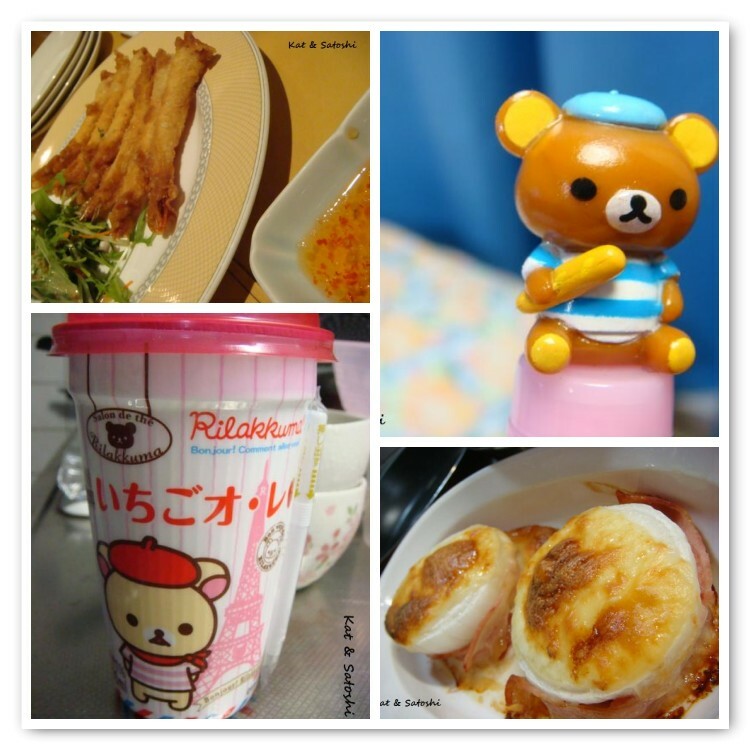 Grilled fish, sashimi, a little hot pot & other foods. It was really filling and everything was delicious. After a very hearty breakfast, we were ready to explore some of the sights in Obama. Sunday, the air was really REALLY bad. The kosa (yellow sand, dust cloud) from China was thick like fog. I swear it smelt like sulpher too. Makes me sick that we were breathing this stuff. Anyway, Satoshi and I headed out to Fukui prefecture, this is in the Hokuriku (North area) of Japan, near the Japan Sea. From Osaka, it took about 2 hours and it was raining by the time we reached our first stop, Tsuruga. We had some time before our connecting train, so we walked their covered shopping arcade and checked out the bronze statues. 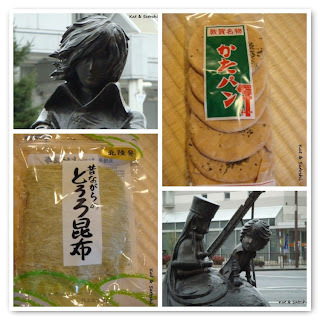 These statues are of characters from the Japanese anime, "Ginga Tetsudo 999" (Galaxy Express 999) by Reiji Matsumoto. Though the artist did not grow up in Tsuruga, he donated some items when Tsuruga celebrated their 100 year anniversary in 1999. Some food items we found in Tsuruga were tororo konbu (a thinly shaved kelp which is slightly seasoned)...400 yen (about US$4) and katapan (literally hard bread). This was a very VERY hard cracker. Not sweet, but with lots flavor from the aonori (green seaweed)...be careful not to break your teeth on these. Apparently there were 10 shops that made this in Tsuruga, now there is only 1, Daruma-ya Kinsei...6 crackers for 250 yen (about US$2.50). From Tsuruga we took a train to Obama. This city got a lot of attention when President Obama was running. There are banners, even shops selling Obama items. The area is often referred to as Wakasa, as it is near the Wakasa Bay. Anyway, this area is the start of the saba kaido (mackerel road). 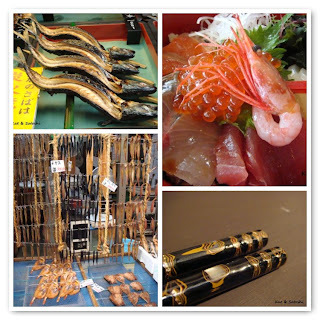 When Kyoto was the capital of Japan, it is said that most food items (including mackerel) travelled from Wakasa to Kyoto. You can find whole saba grilled on a stick at fish shops as well as all sorts of other fresh and dried fish. Unfortunately by the time we got to Obama, the wind and rain had picked up. We stopped for lunch at the Wakasa Fisherman's Wharf and also to get out of the rain. 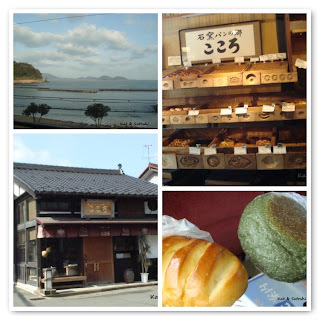 A great place to have some sushi, pick up some omiyage (souvenirs) or just to sit and look at the ocean. The restaurant on the second floor, Kaikoen, serves many different teishoku (set meals). Satoshi had their kaisen donburi (seafood donburi)...1850 yen (about US$18.50). 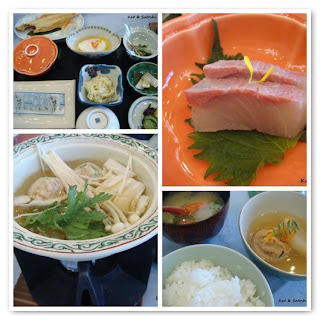 His lunch came with some crab miso soup, tsukemono (pickles) and some tsukudani (salty sweet preserved foods). I chose the oroshi soba and mini amaebi donburi (northern shrimp)...1350 yen (about US$13.50) Oroshi soba is soba (buckwheat noodles) topped with grated daikon (long white radish) and green onions. My donburi had the northern shrimp, some egg and onions. Everything was delicious and the seafood very fresh. 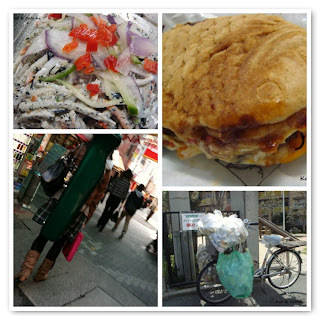 After lunch, we battled the wind and rain and walked to the Miketsukuni Food Culture Museum. This museum had all sorts of displays about Japanese food culture (only in Japanese). They also have a bathing area, where you can look out at the ocean while bathing), and a craft area. The main craft of this area are lacquered chopsticks. Abalone shell and other items are lacquered onto wooden chopsticks. Then by sanding the lacquered chopsticks, what was embedded onto the chopsticks are revealed. I'll continue with more of our adventure tomorrow, stay tuned! We're back from a little trip, but until I can get things sorted out, I hope this post will tide you over. The last time we had sweets from Hamburg was Christmas. On a recent trip to Daimaru in Umeda, I noticed these and asked Satoshi to pick some up on his way home...Pudding a la mode...420 yen (about US$4.20) each. While the colorful fruit jumps out at you, it was actually the ceramic cups that they were in that caught my eye. All the fruit on top was perfectly ripe and delicious with a light layer of gelatin to hold everything in place. When you make your way to the bottom of the cup, there is the caramel....mmm, one more, please! How cute are these? Perfect for a cup of Sakura Vert (a blend of green tea and sakura leaves) by Lupicia. I forget when I learned of this tea, but to me, it truly represents Spring and the cherry blossoms. UPDATE: Hamburg is no longer in Daimaru Umeda. I think I've gotten your attention with the title of the post, no? I was recently in the gourmet supermarket (Seijo Ishii) and came across their sale on teas. Pukka Teas is a UK brand which I was introduced to when I won a couple of boxes from a Japanese foodie magazine that I used to subscribe to. Clarity---organic lemongrass, ginger & amla fruit. I didn't know what amla fruit was, but after looking around on the internet found out that it is an Indian gooseberry. This tea was warming from the ginger. The ginger flavor stands out the most and makes for a nice tea after lunch. Detox--organic aniseed, fennel & cardamom. Loved the spicy aroma, this is definitely nice after dinner or a heavy meal. If I am not mistaken, a reader once recommended "Detox" to me?? What kind of teas are you enjoying? Okay, so there was the "mantra" Me-li-le-pi Om! Now I introduce you to "Me-li-le Poom!" Mexican Lime, Lemon, Poppy Olive Oil Muffins. I found some blue poppy seeds at the gourmet supermarket (Seijo Ishii) and since I had some lemon in my refridge, I decided to "re-try" this muffin, this time remembering to add the lemon juice. I loved the popping of the poppy seeds in my mouth and the citrusy-ness. This was moist and perfect for afternoon tea and for breakfast. Follow this recipe subtracting the pistachios, but adding the juice of 1 lemon and 15 grams (about 2 tablespoons) of poppy seeds. I want to share with you two more strawberries that we've tried. The other week, I walked past a yaoya (vegetable/fruit stand) in our shopping arcade and couldn't pass these up. The sign said "asa-tori" which means "picked this morning". A container of this for 400 yen (about US$4). I'm not sure of the variety but they were fresh, local and sweet. 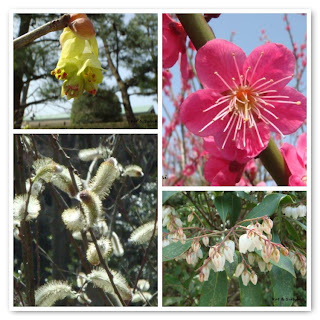 I also wanted to show you Saga Honoka, from Saga prefecture in Kyushu. These berries are quite large and sweet. Their mascot, or "image character" as the Japanese like to call them, is Licca-chan, who is (in my opinion) the Japanese Barbie. Are you loving any fruits lately? We had bought this cyclamen plant back in 2002 to give to Satoshi's grandma while she was hospitalized. Since it had roots, we weren't allowed to give it to her (read about that here). I wonder why after all these years some of the flowers have started to have a white tinge to them? Though Satoshi's grandma passed last year and is no longer with us, seeing this plant bloom is a nice reminder of her strength and her smile. My lavender plants are blooming, freesia plants have lots of foliage (noticed a few buds), tulips starting to peek their heads out. I was particularly amazed by this new leaf emerging from this philodendron selloum...doesn't it look like a dragon's head?? It is the start of a 3-day weekend here...hope you have a nice weekend! I had copied a recipe for these dried cherry scones by A.B. from a cookbook that my mom had. I cut the recipe in half because I only wanted to use 1 egg, but some how the dough was really, REALLY watery. I guess I could have added more flour or something to get it thick enough to roll out, but had a feeling that the amount of flour I would've needed to add would've have been the original recipe amount. Anyway, since I didn't add any extra flour, I baked it as a blob...I cut it into 8 pieces after it was baked...it tasted good, the vanilla sugar added a LOT of flavor, though it was more like a buttery biscuit (moist) than a scone (dry), meh, I don't think I would make this again! not the California burger, that is for sure. We tried it this past weekend...it had the limp bacon that accented all the other "American" burgers...but what made it "Californian" was the red wine sauce...and wine-y it was...it almost seemed as though they didn't burn off the alcohol (if there was any alcohol in the sauce to begin with). Satoshi and I halved this sandwich and I also had 2 bites from the Big Mac that he ordered. It had been many moons since I'd had the "2-all-beef-patties-special-sauce-lettuce-cheese-pickles-onions-on-a-sesame-seed-bun" (was that how the song went?? 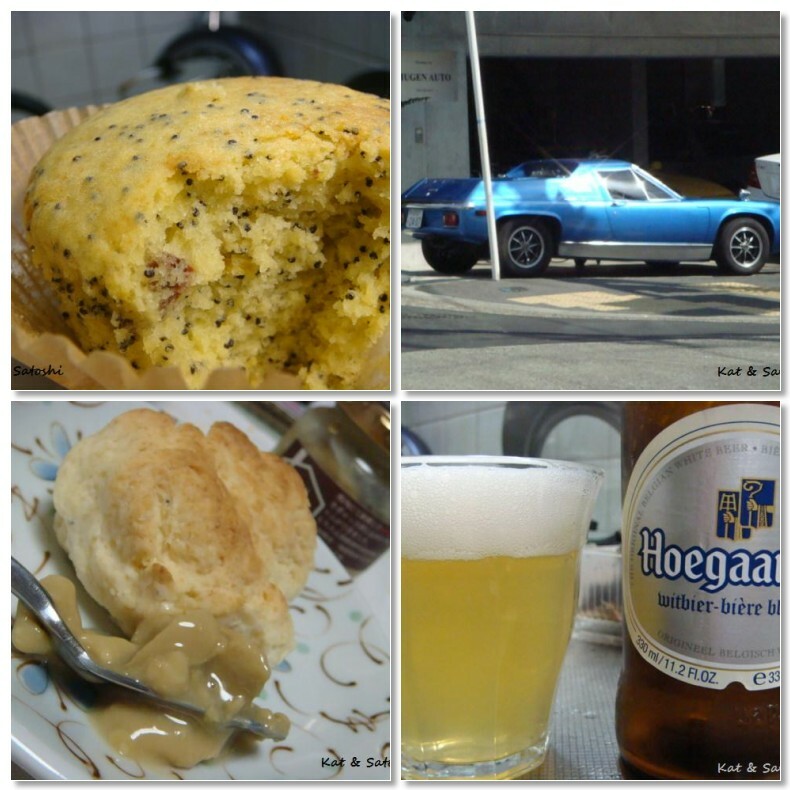 )...THAT actually hadn't changed and was a nice change from those "American" thingies! Anyway, those "American" burgers are done with, we won't be going to McD's for awhile...moral of the story: eat American burgers in America...back to real food. When I was in high school (I think), my Dad let me take his car to learn how to drive manual shift. It was a little stressful because his clutch was short and I wasn't too good with balancing the clutch and gas...let's just say there was a LOT of peeling out and jerking. Then in college, I worked part-time for a rent-a-car company. We used to shuttle the cars from the airport to various Waikiki hotels for guests to rent. It was a fun job, driving different cars (big Lincolns, small Sentras, etc), some automatic, some manual. The most challenging cars for me were the type that the seats would only move up so far, like Jeeps--I can remember having to sit at the very edge of the seat because my feet couldn't reach the pedals. You may or may not know that I love the Mini Cooper...my first car was actually a manual shift Honda Civic, but I sold it before moving to Japan. Anyway, we don't have a car here and don't plan to get one because public transportation is excellent, but if we were to get a car, it would be a Mini (with manual shift). Here are some that I've oohed and aahed at on my walks. At first, this dark green Mini was hiding behind a big delivery truck. Luckily when I got closer, the truck was leaving. A couple of feet away, this red Mini sits in an open parking area. I like how they have the British flags on the roof and side mirrors. 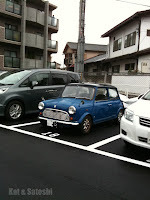 This blue mini was in a parking lot near the DIY store, I felt a bit funny going into the parking area, but am glad I got a shot of it. If you could get any car, what kind would you want? 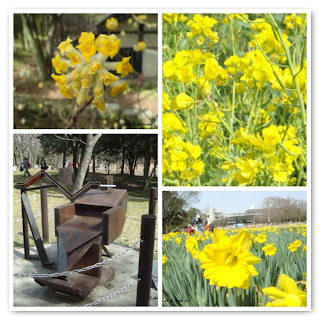 Yesterday was a beautiful sunny day aside from the pollution in the air, which left a slight haze. (bottom right) The tram that you can take (for a fee) around the park. We walked quite a bit I think about 7 km (about 4 miles), but seeing all these flowers and plants was a nice way to end the weekend. Hope you have a great week!